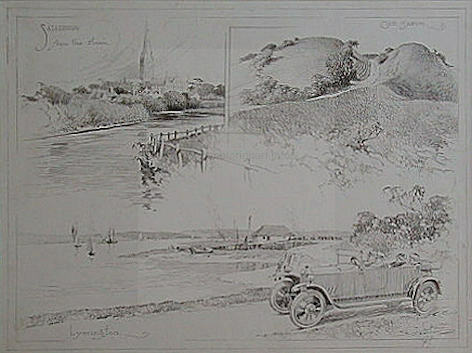 Very few will associate Frank Patterson with being a motoring artist; after all he was the great artist of early cycling. It is said that he abhorred things mechanical on the road other than cycles. 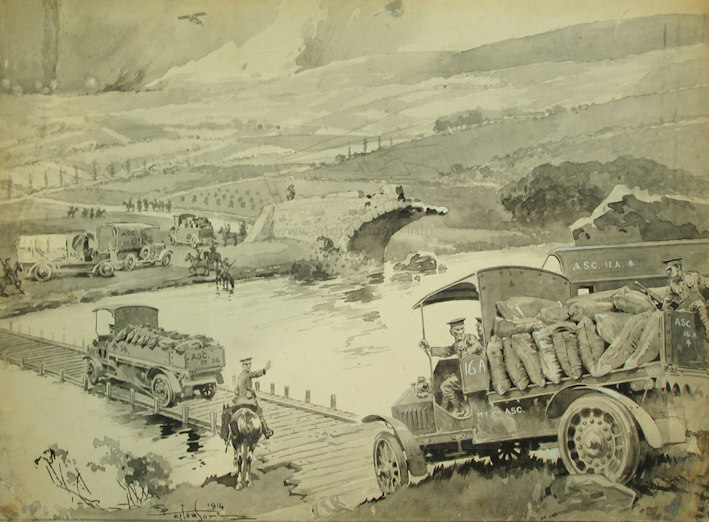 However, through his employment with Temple Press he did a lot of art for The Motor showing motor vehicles of the time. Frank Patterson was born in 1871 in Portsmouth where he grew up and attended Portsmouth Art School. Leaving Art school he moved from Portsmouth to earn his fortune in London. After an initial period as a fine artist and military service he took up employment as a commercial artist. Around this time he became interested in cycling and in 1893 submitted drawings to Cycling magazine. These were accepted and started an association of 59 years until his death in 1952. His drawings concentrated very much on busy line work very close to engravings which he achieved with a fine pen and ink. He occasionally did watercolours and these are equally fine. The drawings also had the ability to be reduced in size for printing but still retaining the crispness and clarity. He was particularly good at portraying the rural scenes and indigenous architecture often working in foliage and tree trunks. 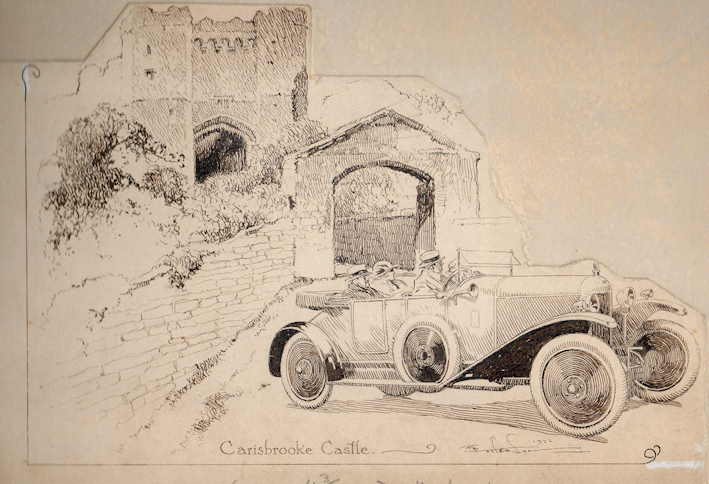 When Frank Patterson’s drawings started to be used in The Motor is not known but was probably in the early 1900’s and went on until after the Second World War. However, it is surprising to see one of his paintings used as a free colour supplement for the rival magazine The Autocar in 1907 entitled ‘Early at the Meet’. 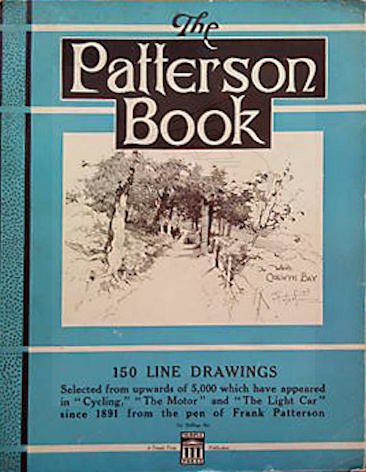 In addition Frank Patterson’s drawings were also used by Light Car magazine from 1939 up to 1952 and an appreciation of his art appeared in the magazine on the 6th August 1952. Hence it is slightly surprising that he was drawing so much art for motoring magazines if he hated cars and motorbikes. Possibly this belief came about because in his illustrations for Cycling he never included any motorised vehicles in the scenes. Also there is the well known cartoon about being anti-motor cycle noise which was published in Motor Cycling magazine in 1925. 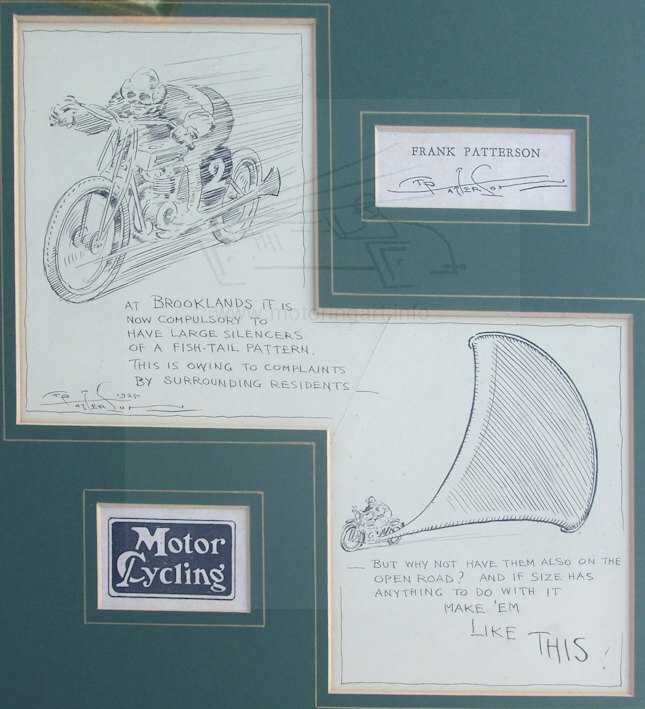 Patterson had an elongated stylised signature with a large second T and S which to some extent was followed by another motoring artist Reg Gammon who was apprenticed to Frank Patterson.